The United Nations Population Fund (UNFPA) and WHO/Europe jointly organized a workshop on 24 October 2013 in Istanbul, Turkey to support the implementation of the National Roma Integration Strategies and the Decade of Roma Inclusion Action Plans. 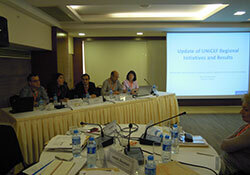 The workshop followed up on the recommendations of the UNFPA/WHO workshop held in Istanbul in October 2011 and reviewed the progress and lessons learned from the national health action plans implementation. It also shared experience and best practices and had the opportunity to discuss how national strategies or action plans contributed to strengthened health systems by facilitating the availability, accessibility, acceptability, contact and effective coverage of services for the Roma population and discussed the remaining challenges and gaps in implementation progress. In one of the sessions, representatives from Bulgaria, Montenegro, The former Yugoslav Republic of Macedonia and Serbia – i.e. countries participating in the WHO/Europe multi-country training on “Reorienting Strategies, Programmes and Activities on MDG 4 and 5 for greater health equity with an explicit but not exclusive focus on the Roma population” - presented their work for the first time on the reorientation process and revisions of their selected national strategies and programmes towards greater equity. The workshop was organized as part of the Interagency Coordination Initiative “Scaling up action towards Millennium Development Goals 4 and 5 in the context of the Decade of Roma Inclusion and in Support of National Roma Integration Strategies.” It is facilitated by WHO and also involves UNFPA, Office of the High Commissioner for Human Rights, United Nations Development Programme, United Nations Children’s Fund, and the International Organization for Migration. On 25 October, the Interagency Initiative partners participated in a meeting to discuss joint planning of activities on Roma health in order to optimize synergies and avoid duplication, and to identify funding gaps and opportunities for joint fundraising.